How do I scan with Document Capture Pro or Document Capture? 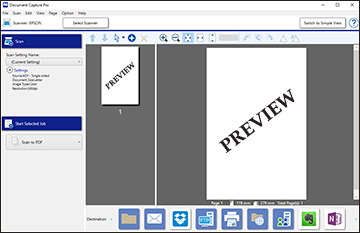 You can use Document Capture Pro in Simple View to quickly select options and scan. Note: The settings may vary, depending on the software version you are using. See the help information in Document Capture Pro for details. Load your original in the product. Windows 10: Click and select Epson Software > Document Capture Pro. Windows 8.x: Navigate to the Apps screen and select Document Capture Pro. Windows (other versions): Click or Start, and select All Programs or Programs. 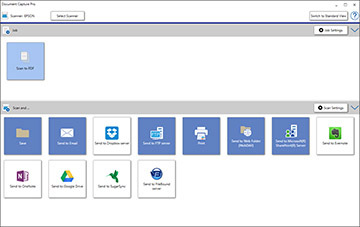 Select Epson Software > Document Capture Pro. Click Select Scanner and select your scanner from the scanner list, if necessary. 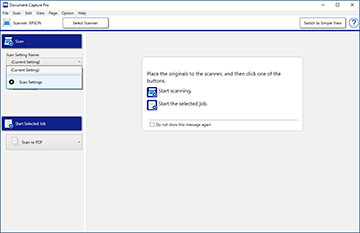 If you want to use a scan job, click one of the job icons in the Job section of the window to complete and send your scan with one click. Note: If you do not see any icons, click the < symbol in the Job bar. If you want to select scan settings for a particular destination, click the Scan Settings button, select any displayed settings you want to use, and click OK. Note: See the help information in Document Capture Pro for details. If you do not see the Scan Settings button, click the < symbol in the Scan and... bar. Click one of the destination icons in the Scan and... section of the window. Your product starts scanning and you see the settings window. Select any destination settings as necessary and click OK. Note: See the help information in Document Capture Pro for details. Confirm your settings and click OK.
You can use Document Capture Pro in Standard View to select settings, preview, and change the scanned file settings as necessary. Select any displayed settings you want to use and click OK.
Click Scan. 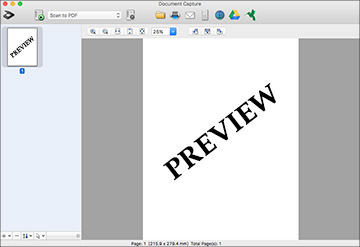 You see a preview of your scan in the Document Capture Pro window. Note: You may have to close the Epson Scan 2 window to view your scan in the Document Capture Pro window. If you would like to scan additional originals and add them to the current captured images, click the Add Page(s) icon and follow the instructions on the screen. Check the scanned images and edit them as necessary. Depending on the destination you chose, click OK or Send to complete the scan. 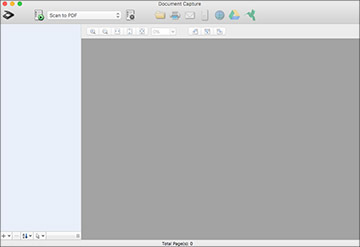 When you scan with Document Capture, the program automatically saves your scanned file on your computer in the folder you specify. You can select settings, preview, and change the scanned file settings as necessary. Note: The settings may vary, depending on the software version you are using. See the Help information in Document Capture for details. Note: You may need to select your scanner from the scanner list. Note: If you want to use a scan job that you created instead, select it from the Job list in the Document Capture window, click the Start Job button, and skip the rest of these steps. Select any displayed scan settings you want to use. Note: See the Help information in Document Capture for details. 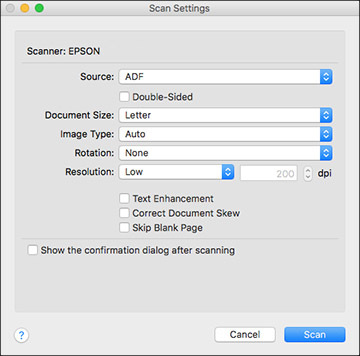 If you want to select detailed scan settings, close the Scan Settings window, open the Scan menu at the top of the Mac desktop, and select Displays the EPSON Scan Setup Screen. 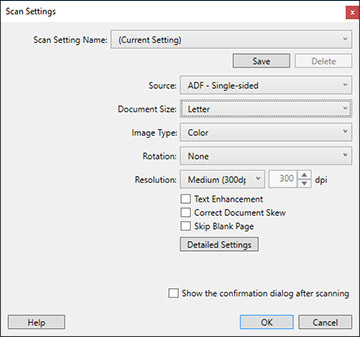 Click the Scan icon and select any detailed scan settings you want to use from the Epson Scan 2 window. Click Scan. You see a preview of your scan in the Document Capture window. Note: You may have to close the Epson Scan 2 window to view your scan in the Document Capture window. If you would like to scan additional originals and add them to the current captured images, click the + icon, select Acquire from Scanner, and repeat the previous steps. Depending on the destination you chose, click OK or Send to complete the operation.